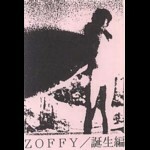 The mysterious first cassette by Zoffy. Includes their cover of “Stairway to heaven”, which floored everyone who heard it. Also includes a massive piece for minimal drones, and pre-Zoffy live recordings by the Tsuyama/Kawabata duo. Comes in four differently colored jackets.